Health shouldn't come with a hefty price tag. We know life is busy and it's easy to fall into the fast food trap. Speed and convenience are key to a healthy lifestyle that works. No matter whether you are a vegetarian or a meat-eater, fruits and vegetables are very important for your health. 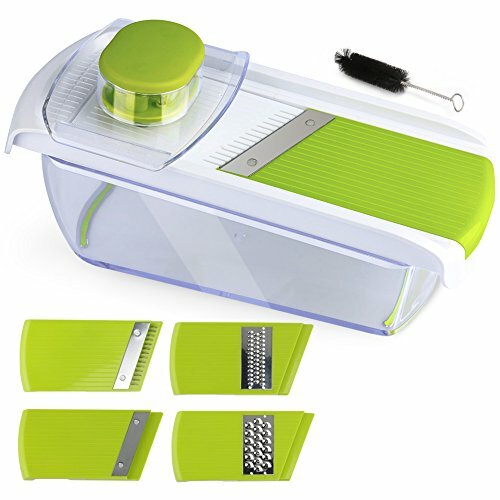 With our Chugod mandoline slicer you'll make DELICIOUS, HEALTHY FOOD FAST. Our veggie chopper comes with 4 blades, 3 setting for standard slicing, and 3 settings for julienne using an easy thumb dial control. You don't need to fill your drawers with kitchen stuff-you just need a kitchen tool that does it all and does it well. Eat better, feel better, and live better. - 1.2L Food container base to catch all your cuts! - Straight slicer - perfect for slicing fresh cucumber or thinly cut potato chips! - Fine grater - Ideal for grating garlic, ginger, nutmeg or even chocolate! - Julienne Slicer - for beautifully consistent vegetable / French Fry strips. - The mandoline slicer blades are very sharp. Please be careful when you are using it. - When cutting food, please use the safety hand guard to protect your fingers. - Clean the mandoline slicer immediately after use to prevent food from drying on the parts. - The device is not designed for cutting meat. With Chugod, your cooking becomes faster and easier. DELUXE SET 4 HIGH QUALITY BLADES - Vegetable Slicer, Fine Grater, Coarse Cheese Grater and Julienne Slicer, Food Container Base. 3 settings for standard slicing + 3 setting for julienne slicing allowing you to create that perfect cut every Time! Meet all of your needs of Cutting, Slicing, and Chopping.With this kitchen cutting kit, you can say bye to watery eyes when slicing onions; And helps you prepare food more elegantly. HIGH QUALITY BLADES - Our high quality blades ensure a smooth and sharp cut every time. Made of high quality stainless steel that will never rust, they are able to handle thick and dense fruit and veggie like apple,potatoes and carrots while smooth enough for tomatoes and other soft vegitable like zucchini. Make your favorite food and salad or use this mandolins as a sweet potatoe chip maker for your favorite chips. BPA FREE, SAFE TO USE & EASY TO CLEAN - FDA and LFGB standard approved ABS plastic is nontoxic and BPA Free; Non-Skid Base to Keep Mandoline in Place Whilst Working on Flat Surface; It fully disassembles for and pops into the top shelf of the dishwasher or flush it directly under the faucet, Includes FREE cleaning brush. BUY IT NOW CAN GET AN EXTRA GIFT - "Mandoline Recipe Ebook" will be Emailed to you After you Purchase, Please Check Your Amazon Email Inbox. So What are You Waiting For? Pick Up the Perfect Spiral Slicer, Vegetable cutter, Vegetable Grater All In One NOW!!! One of the Best Kitchen Gadgets Gifts for your wife or your mom. 100% SATISFIED WARRANTY - Chugod is a famous brand specialized in professional research and development of mandoline slicer. We committed to provide the lifetime quality warranty for every our customers to make sure you would be happy about the purchasing from us. If you aren't happy with your product, for any reason, you can return it to us for a 100% refund within 60 days. A perfect gift for those that love to cook or want to learn. If you have any questions about this product by Chugod, contact us by completing and submitting the form below. If you are looking for a specif part number, please include it with your message.